Two pairs of pliers and a coil of hay wire fashioned in the hands of a Minnesota county agent in 1936 helped solve an urgent need of the federal government's new land measuring program under the Agricultural Adjustment Administration. 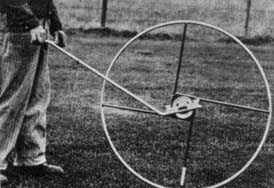 The resulting wire model of the land measuring wheel created by E.S. (Gandy) Gandrud progressed to a rod measuring wheel for acreage measurement. It enabled one person to accomplish what had previously taken two. Borrowing $100 from a local bank, Gandy financed the initial production of the measuring wheel and founded the E.S. Gandrud Company, later renamed Gandy Company. The fledgling firm soon faced new challenges such as how to uniformly apply safer granular forms of various chemicals instead of volatile sprays. Gandy developed a metering device, leading to the development of Gandy spreaders. Troublesome pest infestations coupled with the availability of more granular pesticides brought more challenges to the company. E.S. Gandrud Company soon became known to the industry as "THE GRANULAR APPLICATOR PEOPLE." 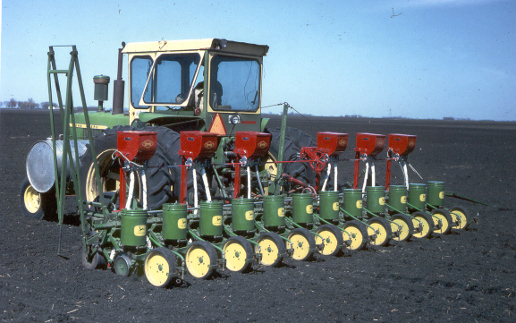 From the 30's to today, the agricultural scene has changed dramatically, and Gandy Company looks ahead at even newer metering devices and greater versatility in materials and rates being applied. Yet from the vantage point of over 80 years in business, we realize our essential task is to make our customers' work easier and safer; while keeping our designs simple and our products accurate and efficient. Today, Gandy Company, located in Owatonna, Minnesota, continues to be family owned and operated. We’re a trusted manufacturer and supplier of agricultural equipment and professional turf care products. Gandy markets and services these products globally. For over 80 years, farmers, ranchers, nurseries, universities, research firms and OEM's have turned to Gandy for agricultural delivery systems to precisely apply granular chemicals, fertilizers, seeds, inoculants and preservatives in an environmentally responsible manner. As a leader in the design and manufacture of professional turf maintenance products, Gandy is a trusted supplier of drop spreaders, lawn rollers, turf brushes, aerators, dethatchers, overseeders and much more to support golf course maintenance, professional grounds maintenance, facility managers, rental stores and OEM's just to name a few. Gandy Company's custom manufacturing division provides products and services to customers in a variety of markets. Our metal fabrication, machining, welding, powder coat painting and turn-key assembly capabilities give our customers a competitive edge. We partner with companies ranging from large corporations to independent start-ups. Since 1936, Gandy Company continues to focus on quality, customer service and integrity.